Is your business thinking about translation? Don’t do anything until you’ve read this ebook. This 107-page guide will tell you everything you need to know about the translation process, how to choose a translation vendor and order translation services, and why it’s so important to get translation and localisation right. Subscribe to our newsletter to receive more exciting articles for translation buyers and updates to this ebook. MOBI – read on the e-readers Kindle and iLiad, PDAs, smartphones, mobile phones, and applications on devices using Symbian, Windows, Palm OS, Java ME and Psion. PDF – read on any device which supports PDF files, including your PC and notebook. To download this free ebook please subscribe to our newsletter. We will never send you nasty spam. From time to time we’ll send you more exciting articles about the world of translation industry and updates to this ebook. But you can unsubscribe at any time. The world of translation services is vast, complex and busy – and although many providers are reputable professionals, it’s still easy for an unsuspecting business to be taken for a ride. Some translation providers will promise the world on a shoestring but fail to deliver the quality you need. Others may overcharge for what turns out to be a fairly mediocre service. 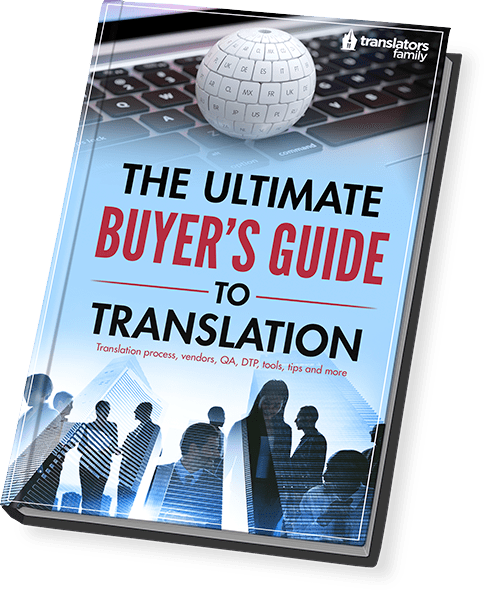 Spotting the good guys requires a practised eye – which is exactly what The Ultimate Buyers’ Guide to Translation helps you develop. As well as learning to tell the fly-by-night cowboys from the reliable pros, you’ll gain an understanding of the translation process, your place in it, and why it’s so important to get translation and localisation right. Clearly written, engaging in tone and accessible to all, this essential guide produced by the experts at Translators Family will make you ready for the translation process and leave you eager to embark on your own localisation adventure. Oleg had a passion for languages and entrepreneurship since he was just nine. That’s why he chose to be a translator and in 2006 successfully started his career as a freelance English-Russian translator. Soon afterwards, he founded a team of translators, which today is a rapidly developing translation agency, Translators Family, based in Poland. Oleg is fond of discovering new trends in the translation industry and applying them to his business. He keeps a blog on his company website as well as publishing his articles across a variety of magazines and web resources for translators. Simon is a British-based translator who works primarily from German into English. After completing a degree in German Studies at the University of Warwick and spending a year living and working in Germany, in 2011 he set up as a freelance translator, editor and copywriter specialising in marketing and information technology. His experience of life ‘in the trenches’ as a freelancer helped provide practical examples and insights into the real world of translation. Sheila is the second native speaker of British English who worked on this book. Her considerable 20+ years’ expertise in translation (French to English) and editing, as well as EFL teaching, allowed her to polish the text of this book and leave it absolutely flawless. Translators Family is a boutique translation agency specialising in Russian, Ukrainian and Polish, with expertise in English, French, German, Italian, Spanish and other European languages. Our mission is to deliver a wide range of top-quality translation and localisation services at affordable prices. Aside from translation, we offer a number of related services designed to maximise value and convenience for our clients. These include desktop publishing (DTP), website and software localisation, multilingual search engine optimisation (SEO), copywriting, transcreation, transcription, subtitling, and more. We set great store by our quality assurance processes, which involve 2-step proofreading as standard and a 5-step extended QA process for very demanding projects. Most importantly of all, we believe in only ever relying on professional-quality human translation. All of our linguists are carefully vetted and tested before they work with us, and we never use machine translation systems. We believe that quality and professional standards are worth defending, and we work tirelessly to champion the right kind of translation.